A skylight will easily turn that old storage room in the attic, into the most popular room in your house. The natural light from the skylight can help decrease your cost of energy and also provide insulation to rooms that may otherwise lack it. Skylights are much more sophisticated these days, and the options are endless. We only install the best skylights here at Absolute Home Solutions, which is why we install Velux and Starlight skylights. These days it’s all about energy-efficiency, and we can promise you that the material we use will not only make your home more energy-efficient, but will meet all the qualifications for a tax credit involving skylights. 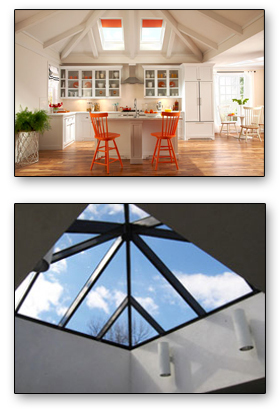 Take a look at some of the skylights we’ve installed, and don’t hesitate to schedule your free in-home consultation. Our experts are very knowledgeable, and always friendly.